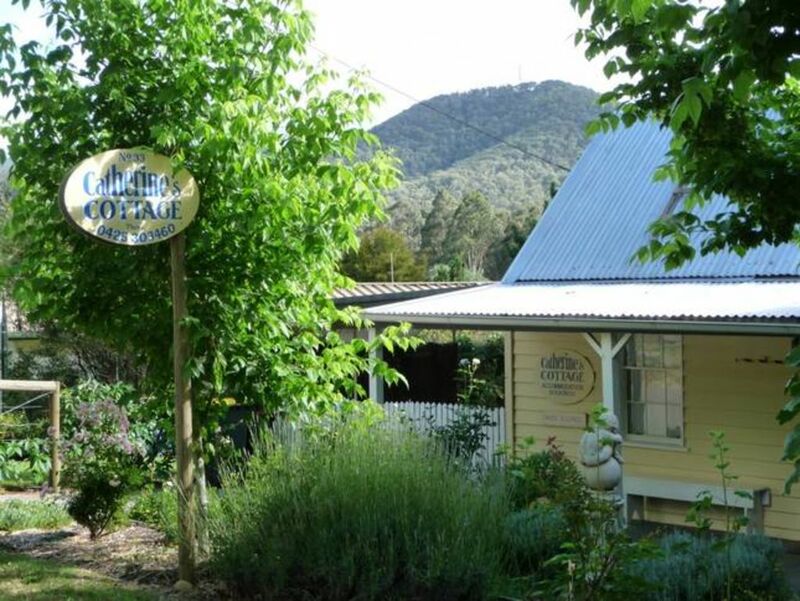 Catherine's Cottage is a beautifully restored miner's cottage (circa 1890) situated within the Alpine Shire and Ovens Valley in Bright Victoria. The cottage is within walking distance to the town centre. With 3 bedrooms (one with ensuite) the cottage will accommodate 6 people in roomy comfort. We also provide extra towels, a big hot bath and split air conditioning to ensure that your stay is memorable. Our aim is to have you return over and over to this delightful property. Catherine's is a place to relax all day or unwind after a big day out. Wood fire and reverse cycle air conditioning for all year round comfort. Two flat screen TV's with DVD players and Bluetooth speaker system for your enjoyment. With a great kitchen plus full bathroom and laundry facilities, this beautiful cottage is designed to be your home away from home. The kitchen, dining and lounge rooms all have polished boards while wood heating ensures cosy winter warmth. In the warmer months, why not take advantage of the outdoor area for a relaxing bbq? The wonderful garden is to be enjoyed by all. Feel free to pick herbs, rhubarb or anything else you may find in the garden to compliment your culinary skills. Three bedrooms (1 x queen, 1 x double, 1 x twin) will accommodate six people plus a cot. Additional features: dishwasher, stove, fridge, microwave, sandwich maker, iron, washing machine, clothes dryer, BBQ, video, 2 x flat screen TV's with in built DVD player, Bluetooth speakers, cot, high chair, toys, sand box and toddler swing. With the Murray to Mountains Rail Trail at your doorstep, Wandiligong just down the road, Mt Hotham only a scenic 40 minute drive plus cafes, restaurants and shops within easy walking distance Catherine's Cottage is the perfect location to rest and relax or be involved in everything that Bright and its surrounding area has to offer all year round. For food and wine buffs Bright and surrounding areas will not disappoint. Cheese, olives, trout, honey, lavender farms, berries and nuts abound just to name a few. Wineries dotted around the countryside with gorgeous cellar experiences and a brewery or two will enlighten your taste buds. Bright is the perfect place at anytime for anyone of any age. We hope you enjoy Bright and Catherine's Cottage as much as we do. Please enquire for rates during school holidays, public holidays and festivals. Within 14 days : No refund. More than 15 days notice : Refund is one nightly rate. Payable by bank transfer only. 1 in driveway and room for an additional vehicle on the front street verge. Great spot close to town. Comfortable and cozy. Excellent location. Cottage was very lovely, quaint & clean. We really enjoyed our stay in leafy Bright. Catherine’s Cottage was beautifully presented & within easy reach of the town centre. Thanks very much for your review Tania. Fantastic to hear you enjoyed your long weekend at the cottage. Lovely charming cottage in Bright, great location and good amenities. Would like to return in the cooler months to make use of the fire! Lovely cottage and garden. Great experience for our 3 nights in Bright. Glasses in open display area had not been cleaned. Used & put back e.g. finger marks, lipstick & some not even dried. We had to put them all back on dishwasher. Hi Anne, we are sorry to hear you were disappointed with the cottage. A firewood order had been placed prior to your stay however because it was late November and almost summer it was not deemed an urgent delivery. The unclean glasses/cobwebs are a concern and we will address this with the property manager and can only accept they were overlooked in a very short turn around between bookings. If guests forget to bring their own toiletries a small quantity are provided. We have now updated the listing to avoid any confusion. We stayed at the cottage ourselves immediately after your visit and had no problems with the TV, we acknowledge it is not the highest quality but believe it is more than adequate. We will open the complimentary DVD’s and check for missing ones. We trust that despite the issues you have raised you managed to enjoy your week. Was very lovely and beautiful place to stay. I would definitely stay there again!! Thanks very much for your review Naomi. So glad you enjoyed the cottage!